The Cuban government said it is willing to negotiate an agreement to compensate claimants for properties that were expropriated after the Cuban Revolution. "What Cuba is willing to do (...) is to enter into a negotiation process in the search for a total sum agreement so that the former claimants, recognized by the US Foreign Claims Commission, can be compensated," he explained. the director for the US of the Ministry of Foreign Affairs, Carlos Fernández de Cossío. As he explained, the number of claimants amounts to 5,913 Cuban exiles, who have filed claims recognized by US courts. In exchange for initiating this negotiation, Cossío asked to initiate "a process of discussion" so that Wahsington compensates the Cuban government for what he described as "material damage from years of military aggression." 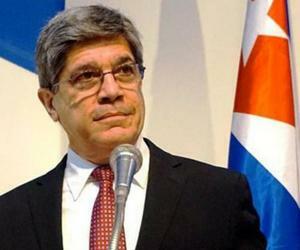 "In a process like that, Cuba is willing to reach an accommodation of mutual compensation with the United States Government," he said in the video posted on the official website of the Foreign Ministry on YouTube. Cossío indicated that the Helms-Burton law "is not applicable in Cuba." "It is a law of the United States and therefore its jurisdiction, its application space, is in the United States.No sovereign country that is respected would allow the extraterritorial application of a law of the United States or another country in its territory," he said. . The diplomat appeared to answer the questions of the users. These comments come after the March 4 leaked information that the US administration was going to lift the suspension of Title III of the Helms-Burton Act, which would have allowed sue some foreign companies operating in Cuba. That same day Secretary of State, Mike Pompeo, said that title III would be suspended for a month, because it was in the "national interests" of the United States. The suspension, which will expire on April 17, prevents Cuban-Americans from claiming before the United States courts properties that were expropriated after the Cuban Revolution. The US administration explained that the extension of the suspension had an exception, since they can file lawsuits against companies that are sanctioned by Washington and that are included in a "black list". These companies are those that belong to the Armed Forces or are "under the control" of Cuban intelligence. This also includes personnel who establish "direct financial transactions" that could harm the Cuban people. Title III has never been applied since its enactment because it would generate a complex web of international litigation with companies from various countries operating in Cuba.